Gemma from our office is a great cook and is always interested in our gourmet experiences. 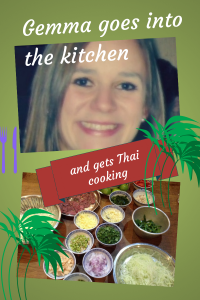 When she had the opportunity to join a Thai cooking class recently she jumped at the chance. Read her review..
“On arrival we were greeted warmly by Food at 52 owner John and his colleague Jessica, who showed everybody downstairs to start the evening with a glass of wine. Great start, I felt immediately welcomed and relaxed. After we had all washed our hands and donned aprons, John introduced the group to the basics of Thai cookery – the ingredients. The main dish on the menu for the evening was a Thai green curry with sea bream and peppercorns (or fresh vegetables instead of fish, for vegetarians like me). 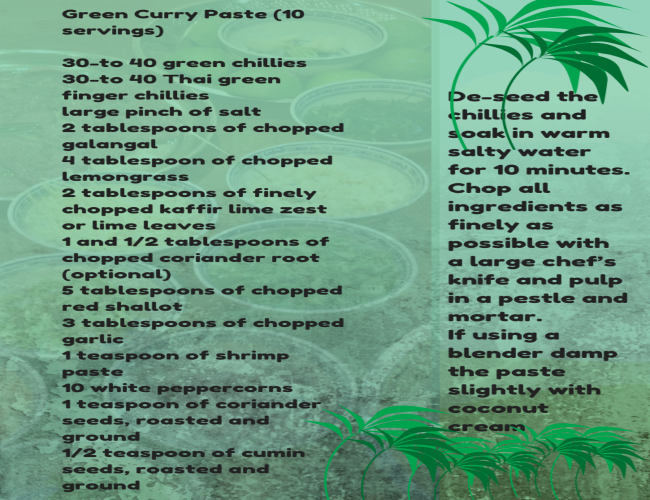 First job – to produce a green curry paste. With John’s instruction, we each began to make our own homemade paste from an array of dishes. Chopping and blending – simple! I was given slightly different ingredients – instead of fish sauce, I used a combination of salt and soy sauce. To start the sauce base off we each took two of spoons of the thick cream that lines the top of any tin of coconut milk. Heating until it started to look oily, we added green curry paste and continued frying for five minutes. Then poured in the rest of the coconut milk to get the right consistency. I added my soy/salt combination, others their fish sauce, followed by the sea bream or vegetables. Meanwhile Jessica was cooking fragrant jasmine rice and our preparations were coming to an end, the time passed so quickly! We all sat down and the dishes were laid out, ready to devour. Prior to enjoying the main meal we had each made ourselves, we were given a prepared starter of papaya salad with beef (tofu for me), which was fresh and tasty. Together with the two courses (and I must say, it really was the best green curry I have ever tasted), plus a mango based dessert and copious amounts of wine, I think it is safe to say all participants were very satisfied! John and Jessica even sat down with us all to eat and have a general chat. They were extremely knowledgeable, happy to answer questions and share their wealth of experience, so it was great for an avid cook like me to get their insight. I have not had the chance yet to make the dish again, but will definitely be re-creating it soon”.